I spent Saturday afternoon on a Jozi art binge, driving from Braamfontein to Maboneng to Troyeville looking at lots and lots of art. I saw tons of amazing stuff. (Side note: Don’t miss the Walter Battiss exhibition at Wits Art Museum — it’s spectacular.) But one particular art installation stood out — quite literally — from the rest: The iThemba Tower at Spaza Gallery in Troyeville. A wide-angle view of the iThemba Tower in the garden of the Spaza Gallery. I’m pretty sure it’s the tallest work of art in Joburg. 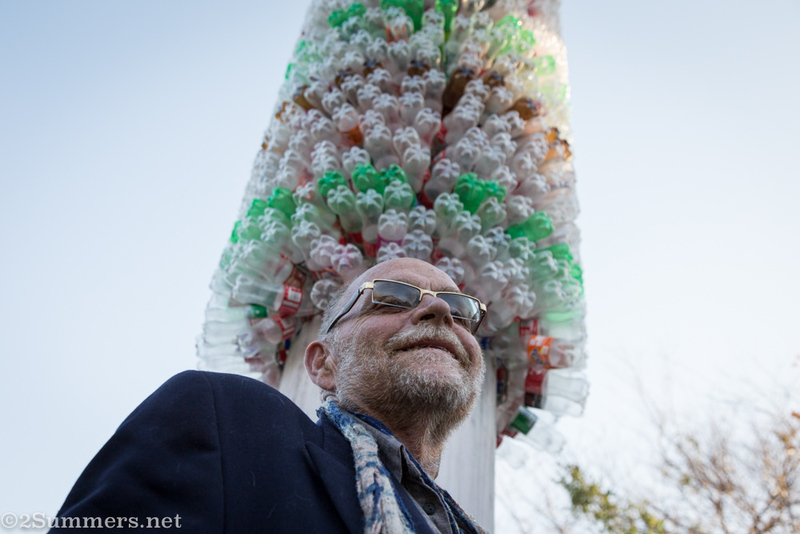 A close-up view of the tower, which is made of bottles. 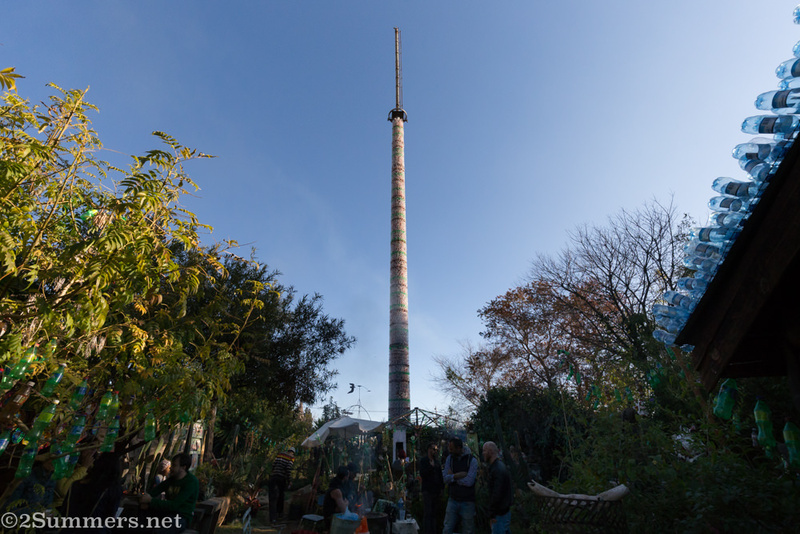 The iThemba Tower is a permanent art installation constructed around a long-abandoned cell phone tower in the garden of the Spaza Gallery. The Spaza Gallery featured in my Top Ten Quirky Places in Joburg post, and has a fascinating story that revolves around the disused cell tower. I’ve been promising to tell the full story of the Spaza Gallery and it’s founder, Andrew Lindsay, for years. I will keep that promise, and I think the day is drawing nearer. Andrew Lindsay, founder of the Spaza Gallery, beneath the tower. 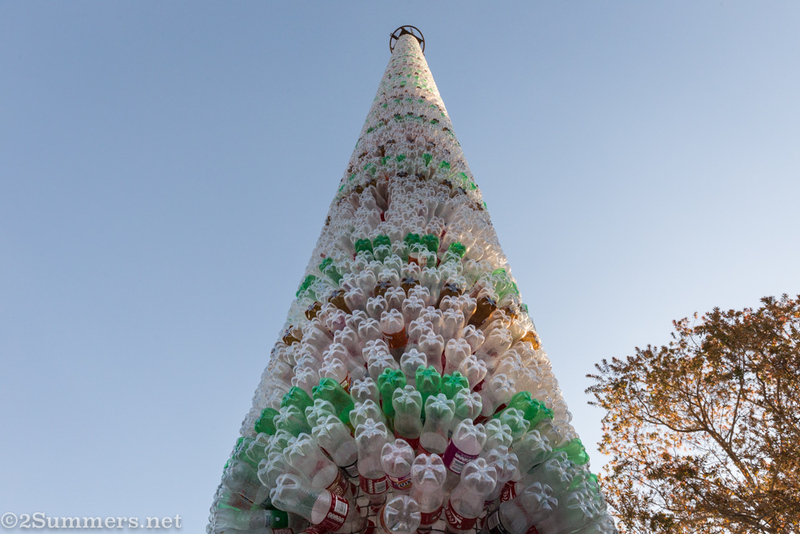 The entire gallery garden is decorated with bottles. Check out the shed roof in the background. But anyway, back to the tower. It was officially unveiled on Saturday afternoon and my friend Fiver and I had intended to stop by the Spaza Gallery, have a quick look, and go on our merry way. But once we arrived and saw the tower and the fanfare surrounding it, we realized this piece of art was worth more than a brief drive-by. We stayed all afternoon and into the evening, watching the tower change colors as the daylight faded. It looks like a Christmas tree from this angle. What is the iThemba Tower? 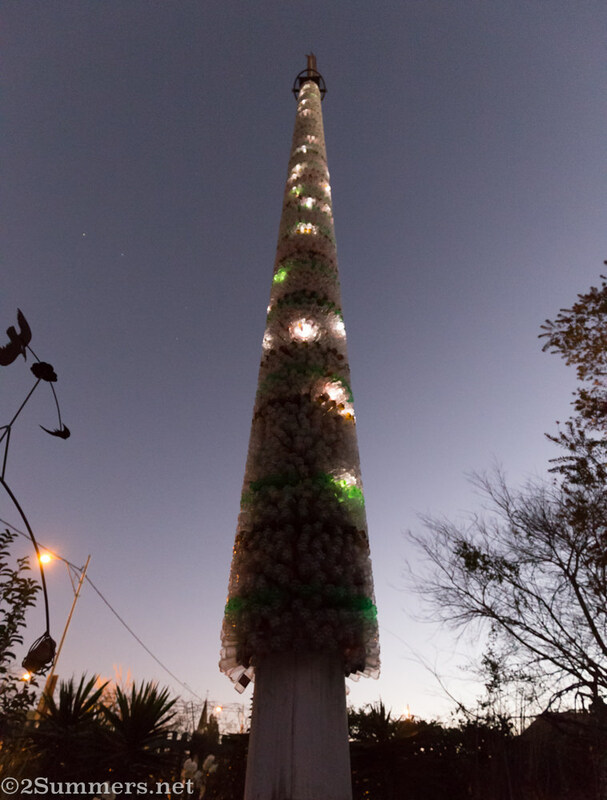 The iThemba tower is made of 7000 plastic soda bottles (“cool-drink” bottles to the South Africans among you), many of which contain paper “messages in a bottle” about Joburgers’ hopes and dreams. I asked artist r1, the creator of the project, how the iThemba Tower got its name. He explained that iThemba means “trust or hope” and that the tower is “a symbolic communication tower around which a diversity of people can share their collective hopes.” In creating the project, r1 hopes to increase awareness around Joburg’s informal waste collectors and the recycling process in general. r1 and his colleagues have created a fantastic tumblr blog about the iThemba Tower, as well as several short videos about the waste collectors who contributed to the project. 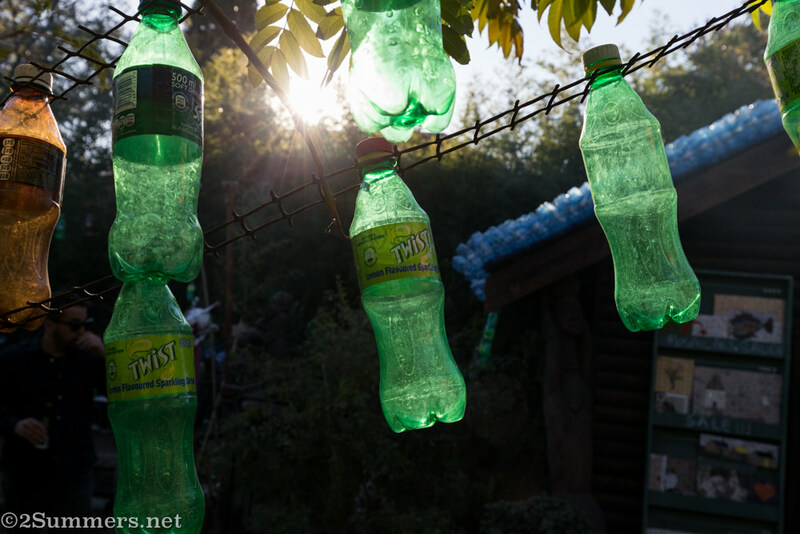 The blog, the videos, and the inspiring stories of the waste collectors took my breath away. Please watch/read them, as they tell the iThemba Tower story much better than I can. Oh, and the tower lights up at night. The lighting-up was hard to capture because I didn’t have a tripod. 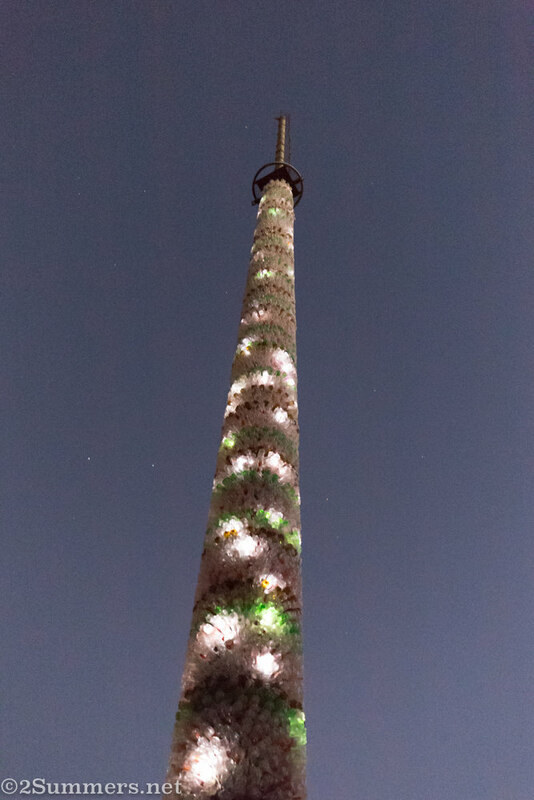 But the tower contains hundreds of LEDs that blink on and off. If you’d like to check out the iThemba Tower yourself, please contact the Spaza Gallery. The gallery is open most days but it’s best to make arrangements in advance. If you’d like to contribute to the iThemba Tower project or to the waste collectors who helped to build it, contact r1 directly at r1r1r1@gmail.com. Thanks Dad. Drew is very photogenic. Such an awesome photo of Drew and the tower, glad I got to spend some time with you and Fiver. It’s like the Jozi version of the Eiffel Tower with all those twinkling lights. How lovely. That’s so true! Hadn’t thought of that. I saw the start of this a couple of years ago when there were only a few bottles on the bottom part. Great to see it in all its splendor now! Oh wow, I didn’t realize it started so long ago. Cool! Nice! Cool and very unusual. Is it permanent? 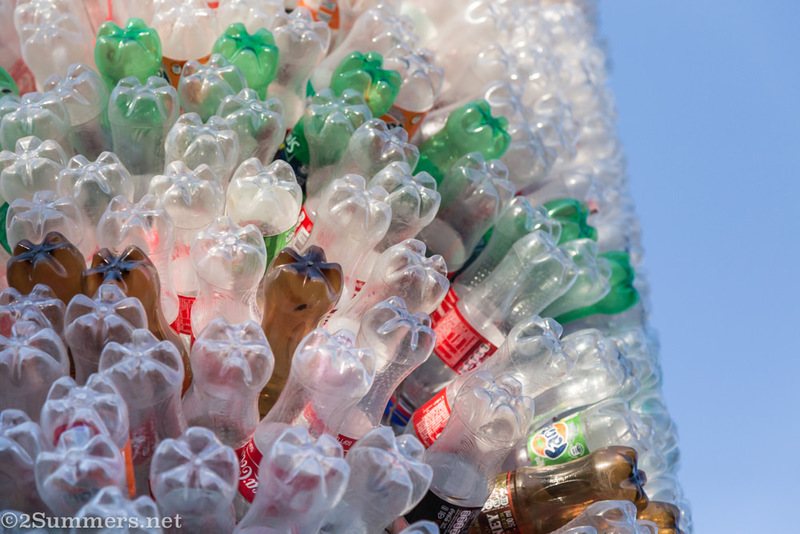 I think so, for as long as those plastic bottles last (which I guess is probably like a million years).